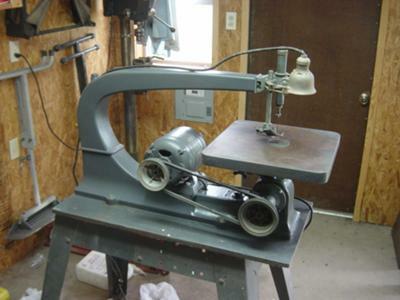 I have had this Delta scroll saw for several years and have never really used it. The patent numbers range from 1931 to 1937. I think the stand is Craftsman and not original to the saw. I also doubt if the motor is original. The cord to the light needs to be replaced. It uses pulleys with three belt settings, so I assume it has three speeds. It works fine but seems to have a problem with keeping the blade in the upper mechanism. It may be just me. I would like to sell this to someone who would really like to have it and am asking $200.00. I can be reached at 903-413-3265. I shop regularly at the local Habitat Restore. Suffering with an underpowered and too small Ryobi I jumped at the chance to get this old Delta Saw with the big throat for $75. It weighs a ton. I just found out that it is a model 1200. It runs perfect, has 4 step pulleys, a working air blower, the original motor and probably the belt. The pictures I've seen show a dark colored saw but mine is an off white. It looks original, and has the original stand. I have this exact model.